Now that the longtime Democrat presence in NC government has been eradicated and a new NC voter ID law has been passed, perhaps we can come closer to insuring that our elections are fair. From the Winston Salem Journal October 23, 2014. “The State Board of Elections will not be able to verify before the early-voting period begins today whether all of the nearly 10,000 names that it has flagged as belonging to possible ineligible voters are in fact ineligible, according to interviews with elections and transportation officials. Elections officials estimate that most are likely eligible to vote, but the uncertainty has led some state lawmakers to question why the verification process is happening now. The Winston-Salem Journal reported Wednesday that, according to the SBOE, a specific search of those 10,000 names on the state’s voter rolls turned up 145 that belong to immigrants in the U.S. under the federal program known as Deferred Action for Childhood Arrivals, or DACA, which provides qualified applicants with a two-year reprieve from deportation. “The SBOE is in the process of sending letters to the 119 DACA license holders seeking proof of citizenship, said SBOE spokesman Josh Lawson. Separately, Lawson said that the SBOE is also working to verify all of the nearly 10,000 names. The Journal has asked to receive that information when it becomes available. The DMV sends data to the SBOE on a regular basis, Charbonneau said. That data includes license holders who are tagged as “legally present,” which includes anyone who was not a U.S. citizen when he or she got a license. The DMV has been “assisting” the SBOE on verifying the names at this time — as the early-voting period begins — because the SBOE requested the assistance on Monday, according to Charbonneau. Apart from the DACA license holders, the names on the list of nearly 10,000 belong to license holders who were not U.S. citizens when they got a license. They may have been green-card holders, foreign workers or foreign students, for example. Most have become U.S. citizens since getting a license, according to an estimate by elections officials based on a sample of the overall list. From the Raleigh News and Observer June 28, 2014. “When Chuck Stuber shows up, politicians are in trouble. He’s the FBI agent who put handcuffs on former House Speaker Jim Black and former U.S. Rep. Frank Ballance Jr.
From My Fox 8 October 23, 2012. “GREENSBORO, N.C. –The Presidential election is just around the corner and voting issues have already become a problem in Guilford County. One of the voters, Sher Coromalis, says she cast her ballot for Governor Mitt Romney, but every time she entered her vote it defaulted to President Obama. If this has happened to you or if you have had another problem voting in NC, leave a comment here. Tagged Board of Elections Director George Gilbert recurring problem, Greensboro Guilford County votes default to Obama, Romney vote override, Voting machine calibration problem? Voter fraud in NC is being investigated again and for good reason. Governor Beverly Perdue vetoed the NC voter ID bill passed by the legislature. From WRAL News June 23, 2011. “Gov. Bev Perdue has vetoed a controversial proposal to require voters to show photo ID at the polls. The voter ID bill was passed by constitutionally elected legislators who represent the majority of North Carolinians. Governor Perdue overrode the will of the people. She refers to the “constitutionally guaranteed right to cast their ballots” for “North Carolinians who are eligible to vote.” What about the rights of North Carolinians to not have their votes diluted by ineligible voters? From Citizen Wells April 5, 2011. “Students from area universities have been working behind the scenes to protest the proposed voter ID bill that is currently in the House. They held a forum Monday morning to discuss the bill and followed it with a press conference to voice their concerns. “Obama’s campaign wants to tell the world they registered 800,000 blacks out of a million voter base, so that before in the election only 200,000 blacks voted in North Carolina. A Durham (NC) official is asking state elections administrators to check approximately 80 voter registration forms for possible fraud. Mike Ashe, Durham County’s elections director, said the forms were among about 4,000 submitted to his office over the past four to six weeks by a national left-wing group called Acorn, for Association of Community Organizations for Reform Now. “They will be turned over to the State Board of Elections for investigation and prosecution,” Ashe said of the questionable documents. Most of the forms at issue bear one of six names. Ashe was not sure whether the people named existed or not. Jim Pendergraph, who entered the race for NC 9th Congressional District Republican Congressman late (Feb. 2012), will be in a runoff election with the other top vote getter Robert Pittenger on July 17, 2012. This despite the efforts of the Charlotte Observer to discredit him after endorsing him. From the Charlotte Observer May 9, 2012. “Republicans Robert Pittenger and Jim Pendergraph, whose feuding dominated the crowded primary in the 9th Congressional District, are poised to take it into a July 17 runoff. Buoyed by strong showings in the Charlotte suburbs, Pittenger led the 10-man field with about 33 percent of the vote. Pendergraph had about 25 percent. While each fell short of the 40 percent needed to win outright, both lapped the 10-man field. Edwin Peacock, a former Charlotte city council member, ran third with about 12 percent. State Rep. Ric Killian had about 10 percent. No one else had more than 7 percent. The eventual winner will be the favorite in November against Democrat Jennifer Roberts and Libertarian Curtis Campbell in the heavily Republican district that includes most of Mecklenburg County and parts of Iredell and Union. The candidates are running for the seat being vacated by Republican U.S. Rep. Sue Myrick of Charlotte. It’s open for the first time in 18 years, and only the fifth time in six decades. But only two House candidates in the country spent more of their own money. Outpacing his rivals, the Charlotte real estate investor and former state senator gave his campaign $1.1 million. Pendergraph, a Mecklenburg County commissioner and former sheriff, has run as Myrick’s hand-picked successor. He was the target of a barrage of ads by Pittenger. Pendergraph, under attack from Pittenger and a super PAC that supports him, struggled to compete financially. Pittenger defended his ads, which have flooded mailboxes as well as airwaves. “Last week Pendergraph stirred controversy when he said he had “reason to be suspicious” of President Barack Obama’s claim that he was born in the U.S. and thereby eligible for the presidency. His remarks on the “birther” issue prompted the Observer to retract its endorsement for the first time. It also appeared to cost him some votes. Mr. Ellis, you have been lied to by the mainstream media. Jim Pendergraph, I applaud you. When in the Charlotte area in recent years, I heard nothing but good things about Jim Pendergraph. Obviously the Charlotte Observer had the same opinion before Pendergraph questioned the messiah, Obama (see quote above). Read the history of Jim Pendergraph being endorsed by the Charlotte Observer and then attacked by them. Why any concerned American should question Obama. Mitt Romney wins NC Republican primary. Obama has a NC problem and it is getting bigger. Jim Pendergraph, who was endorsed by Sheriff Joe Arpaio, who questioned Obama’s birthplace and had his endorsement by the Charlotte Observer rescinded, is in a close battle with Robert Pittenger in the Republican 9th district US Congress race. illegal aliens beeing allowed to register to vote. There is no reason to believe this has diminished. statutes. I also insured that they were forewarned so as not to have ignorance as an excuse later. channels in an orderly fashion. However, I did not want to let much time elapse before informing you of the methodology and progress. is backing off. Her administration has been plagued with scandal, some of which is tied to the NC State Board of Elections. dictates but as the US Constitution and State Law demands. The other is the level of corruption and bias within the board and other departments. will it be the Democrat Party and the desire to look good hosting the Democrat Convention. From John Hammer of the Rhino Times February 2, 2012. “North Carolina Gov. Beverly “Dumpling” Perdue announced last week that to benefit the school children of North Carolina she was not going to run for reelection. One might assume that Perdue thinks the school children of North Carolina will be better off without Perdue in the governor’s mansion. I agree with her, but for some reason I don’t think that is what she meant. She tried to say in her terse announcement that by being a lame duck governor she would be better able to fight for school children. It makes no sense. There is a reason why they call someone in office who is not running for reelection a lame duck and that is because they don’t have much power. They cannot threaten to make opponents’ lives miserable for the next four years or threaten to veto legislation coming up in the next session. They can beg and plead, but a governor can do that whether they are running or not. There are only two reasons that come to mind that would explain why a sitting governor who has repeatedly said she was going to run for reelection would, two weeks before filing opens, announce she isn’t going to run. One is health. I have it on good authority that the governor is not stepping down because of any health issues. The other is because she has learned that she is about to be indicted. Her mentor, former Gov. Mike Easley, was indicted after leaving office and was convicted of a felony. Several of Perdue’s 2008 campaign staff have been indicted: Her finance chairman, Peter Reichard, who is the former president of the Greensboro Chamber of Commerce, was convicted of one felony in connection with the 2008 Perdue campaign. Two other people associated with the Perdue campaign were also indicted. Of course it could be that Perdue realized there was no way she was going to beat Pat McCrory again and decided not to prolong the agony. However, that seems highly unlikely. Candidates almost always think they are going to win. They may say that they know they don’t have a chance but in their hearts they have this belief that somehow at the end of the night they will be declared the winner. I have interviewed candidates on the eve of the election who finished with less than 20 percent of the vote but they could explain in detail why despite the odds they were going to win. Perdue beat McCrory once, even though the polls had said early on that McCrory was ahead. One theory is that the National Democratic Party asked Perdue to step aside because she couldn’t win, and not having a strong candidate would hurt President Barack Hussein Obama’s chances of winning North Carolina. Right now it looks like Lt. Gov. Walter Dalton is going to be the Democratic candidate, and although he holds statewide office the vast majority of the people in the state have no idea who he is. It just doesn’t seem possible that the National Democratic Party is so out of touch that it believes Dalton would help Obama more than Perdue. Of course, someone should tell the Obama campaign that they are not going to win North Carolina. Four years ago the Republicans ran an extremely poor candidate and the Democrats had an extremely charismatic one. Plus four years ago Obama was making history by becoming the first black person elected president of the United States. He can’t do that again. Four years ago no one could blame Obama for the economy. Today people do blame Obama for the economy and it appears that his solutions have not worked, although he is going to campaign like they have. From Citizen Wells Tuesday, June 21, 2011. “Before accessing the impact of the ruling, especially regarding eligibility cases, the Citizen Wells blog will revisit some articles from 2008. It was apparent to us and many legal scholars that any citizen had standing to question the eligibility of Barack Obama, especially when many states indicated they had no authority or responsibility to do so. Per the Tenth Amendment, that gave the power to citizens. There are probably multiple reasons why the US Supreme Court chose to not take on any of the Obama eligibility cases. Clearly one of them is the fact that there are provisions in place to safeguard elections. One of them, grossly ignored, is the right of citizens to uphold the Constitution via Tenth Amendment Rights. From Citizen Wells November 17, 2008. Governor Mike Easley has overall responsibilities as well as Electoral College certification. Attorney General Roy Cooper is charged with compliance with all Federal and State laws. Secretary Elaine Marshall is responsible for the NC Election process. NC Board of Elections is responsible for the NC Election process. NC Electoral College Electors are responsible for complying with Federal and State laws. NC Judges ruling on election matters are bound to uphold the US Constitution and Federal and State laws. US Constitution, Article II, Section 1. Presidential eligibility. US Constitution, Article II, Section 1. States are responsible for Presidential Elections up to Electoral College vote. NC Statute § 163‑19. State Board of Elections; appointment; term of office; vacancies; oath of office. NC Statute § 163‑23. Powers of chairman in execution of Board duties. The State of NC, State Officials and Election Officials are responsible for the Presidential Election in NC up to and including the vote by the Electoral College Electors of NC. The Electoral College Electors of NC are bound by the US Constitution and Federal and State Election law to vote for an eligible presidential candidate. The Governor’s office, the Secretary of State’s office, the NC State Board of Elections and the Electoral College of NC has been notified in public and private of major issues surrounding the eligibility of Barack Obama. The office of the Secretary of State and Board of Elections was notified multiple times, prior to the general election, of the Philip J Berg lawsuit and facts regarding Barack Obama’s ineligibility. The notification was via telephone conversation and emails as well as notification on the internet. The Board of Elections stated they had been aware of these issues for several months. There are pending lawsuits in NC courts, other state courts, as well as US Supreme Court, challenging the eligibilty of Barack Obama. Barack Obama has refused to supply legal proof of eligibility. Pending or dismissed lawsuits have no bearing on the obligation of NC officials to uphold the rule of law. Failure of NC officials to uphold the law and their election duties may result in the disenfranchisement of millions of voters. The state of NC has complete control of the presidential election process in NC up to and including the Electoral College vote. Placing a candidate on the ballot at the direction of a major political party does not relieve NC election officials of their duty to ensure eligibility of candidates. The state of NC in NC Statute § 163-114 provides for replacing a candidate that “for any reason becomes ineligible or disqualified”. The Tenth Amendment to the US Constitution gives power to the people not reserved for the federal government or the states. The laws on the books not only allow, but require that NC officers and Elections Officials demand proof from any presidential candidate of eligibility. 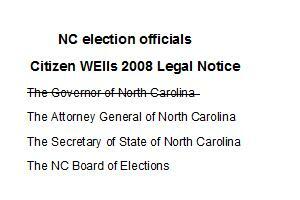 Citizen Wells will be providing this information to the officers and Election officials of NC. If a satisfactory answer is not received soon, petitions will be initiated to remove non compliant officials from office. Judges are not immune. The answer is in the Declaration of Independence.